← Squeaky Floors Got You Down? Zoroufy is a wonderful manufacturer of decorative stair rods, wall rug hangers, cast solid floor registers and wood baseboard registers. During the month of April, Installerstore.com is the “Featured Online Retailer of the Month” for Zoroufy. To celebrate, we are offering 10% off ALL Zoroufy products on our site! Just call our toll-free number 866-258-1554 and place your order with one of our wonderful sales associates. 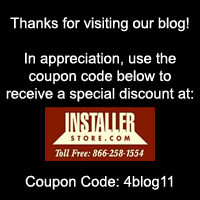 Mention the installerstore coupon code of zor10deal and we’ll take 10% off all Zoroufy products!! Zoroufy has many different collections of stair rods to match any home decor. There are multiple styles, finishes, finial choices, rod diameter, rod style and lengths to choose from. All finishes will have a protective lacquer coating to resist tarnishing. Stair Rods are sold in sets. Each set has (1) rod, (2) brackets and (2) finials. All pieces will have matching finishes. Finials are decorative pieces that are screwed directly into the brackets. This gives the stair rod a more decorative, less industrial look. The overall length of the finial depends on the type, ie pineapple, round etc. Think you’ve found your dream stair rods? Click the photo of your favorite collection below, to view them on our site. Don’t forget to call your order in with the Installerstore Coupon Code to receive 10% Off!!! Looking for a Tapestry/Rug Hanger as well as stair rods? Or how about heavy cast decorative floor registers? The Zoroufy quality carries over into these products as well. Revamp your house – save 10% in the process. Check back for more informative blogs this month on Zoroufy’s products.